Because I no longer have the book, I can’t say for sure how many points it is, but I seem to recall that a healthy portion was no more than about four points. Really, think about it, it’s full of high-fiber beans and only contains a little bit of ground turkey. In fact, if you are vegetarian and are willing to take a chance, I can easily imagine this chili without the turkey at all. I don’t think it would suffer. If someone gives it a try, please let me know! *The rinsing and draining is NO JOKE. Only skip this step if you like things really spicy! In a large nonstick saucepan or Dutch oven, heat the oil. I wheedle Dan into chopping these. Add the turkey, bell peppers, onions, garlic, cumin, oregano, cayenne and bay leaves. 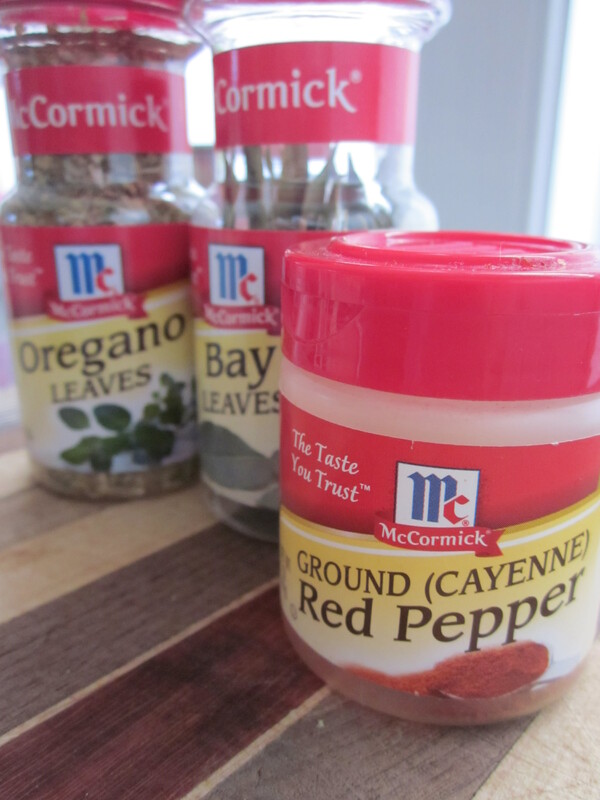 We were out of cumin (incredible…who runs out of cumin?) so we substituted 1 1/2 Tb. of chili powder for the cumin and the cayenne. It worked fine. Cook, stirring as needed until the turkey is browned and the vegetables are softened, about 6-8 minutes. Add all the other ingredients and allow it to simmer covered for about 45 minutes, stirring occasionally. Remove the bay leaves if you can spot ’em and ladle the chili into bowls. If you want, serve up with a garnish of sliced scallions and a tiny bit of sharp cheddar or sour cream. Beer is optional, of course! When Dan tasted this, he couldn’t believe how spicy and creamy it was – and how low in points. In the tradition of good “diet” cooking, it gives you enough heft and spice to make you feel like you really ate well. And you did! In every sense. Bonus – this freezes really well for those winter lunches at work. I wouldn’t call this recipe “baby-friendly” but I have a strange one here. 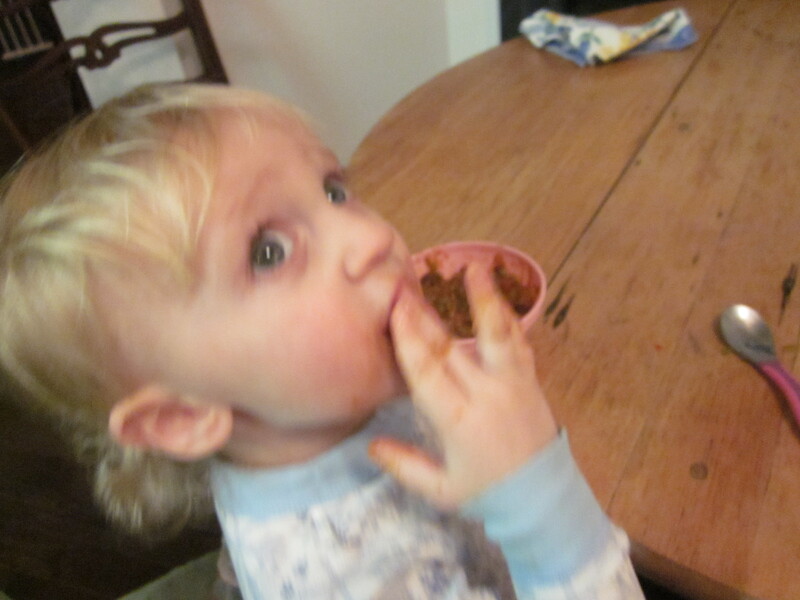 Cormac ate two bowls of this chili and chortled “nom nom nom” while he was eating. If you have a kid who tolerates spice, you can feel good about giving it a try. Just doing my part to raise the next culinary generation, here. May all your resolutions come to fruition! Great recipe, FF. 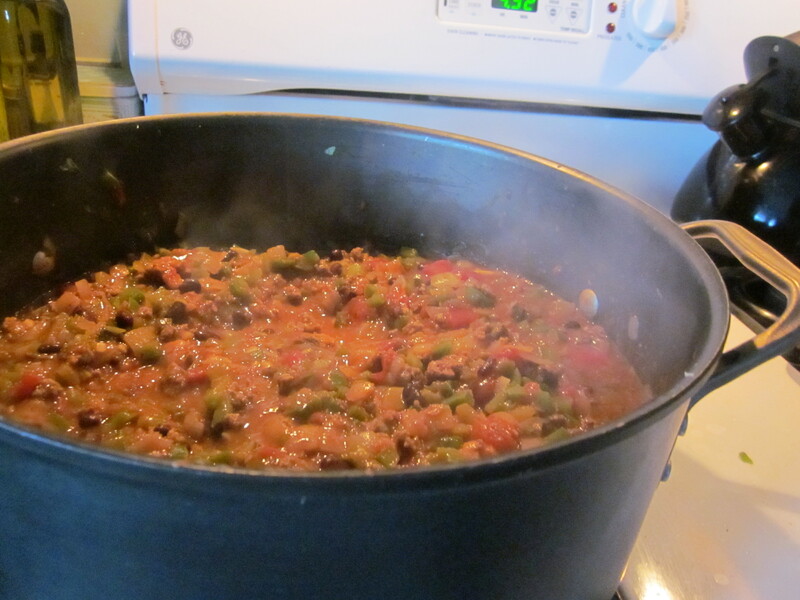 If you put the ingredients into the Points calculator for almost any chili that involves a good ratio of veggies/tomatoes/beans to meat and fat, it’s on average 4-5 points per serving. Which means going back for seconds only makes it a 7-point dinner. Score! 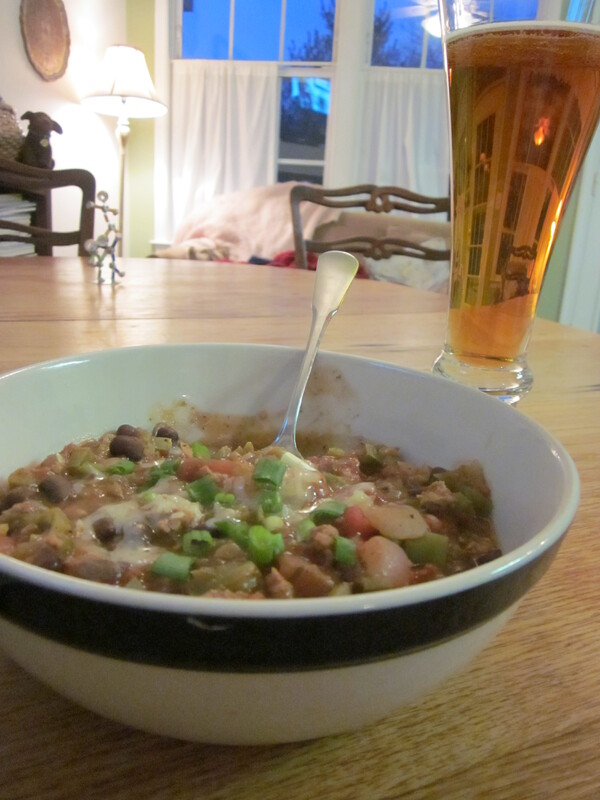 I *love* chili and was psyched to try this recipe on a cold snowy day. I cheated in the other direction – made it more fattening (baaad Kim!). I’m not crazy about ground turkey so I used very lean ground beef. I was extra naughty and used a few tablespoons of bacon grease from breakfast. The other substitution I did out of laziness – I used 2 bags of frozen fajita vegetables (onions and red, yellow, & green peppers) and put them through the food processor so they were chopped instead of strips. 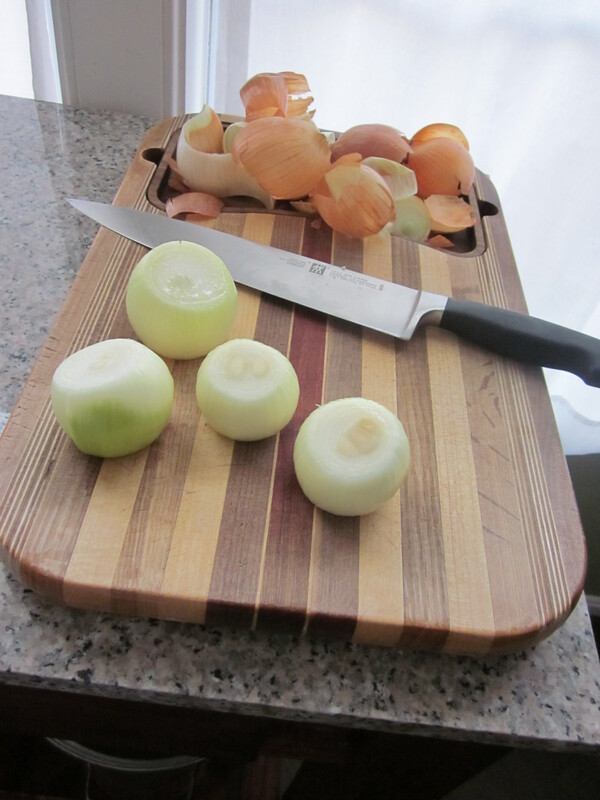 That prevented the chopping of fresh vegetables which is generally a task I loathe. The chili is AMAZING. The addition of the fat free refried beans is such a great idea – adds that creaminess you spoke of in an unexpected and less fattening way. My dad, the chili expert, also told me that sometimes he runs a small portion of the final cooked chili through the blender or food processor which also can give some creaminess. I’m so glad your substitutions worked for you! I have a soup for which I use that frozen pepper mix – meatball albondigas. It’s a great shortcut. Your Dad’s suggestion makes me think an immersion blender would be even easier (and I got one for Christmas!). Thanks for the comments. This looks and sounds so delicious. I happen to love turkey but don’t cook it (yet…need to get over my fear that I may possibly kill someone if I try cooking poultry. Growing up in a strictly veggie household will do that to you). I will try this without. Often I use TVP as a “meat substitute” in chili (I actually loathe the idea of meat substitutues…as though vegetarian meals are not good in their own right without meat!) but TVP is so cheap, has great texture, and actually doesn’t taste bad. I will let you know how it goes! I honestly think you could add another can of beans and hardly miss the turkey. I’ll be very interested to hear how it goes, so please report back! Thanks so much. I am sooo glad I came back by for a visit!! LOVE the idea of using the fat free refried beans! I have some in the cupboard, and pretty sure the rest of the ingredients are also waiting to be used!! I am going to use some very lean venison burger as I had just pulled out of the freezer for dinner tomorrow! I would have done this meatless quite honestly, but now the meat is on the menu. I have to agree about trying your new immerson blender! I love to use mine in my pea soup…just to help out the creaminess…oh and potato too! 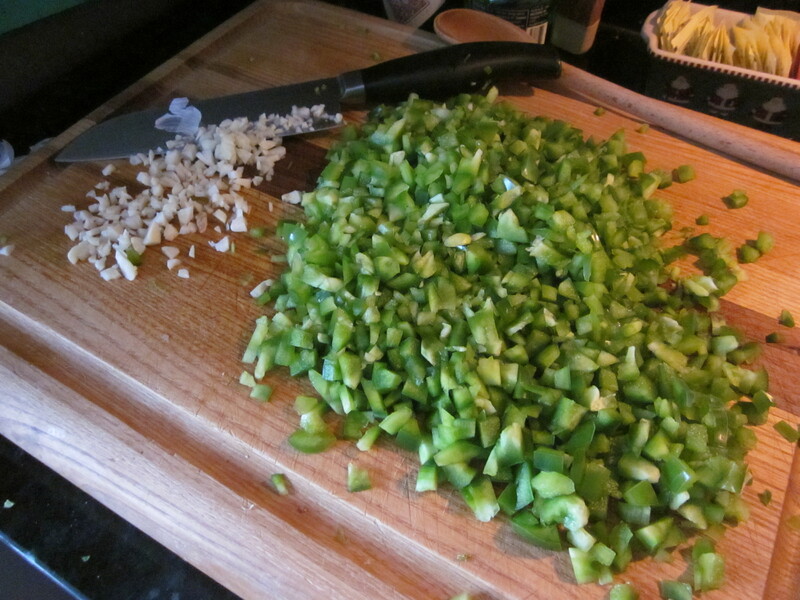 No canned jalapeno…will probably use fresh as I have to get green peppers anyways. I’ll let you know how it turns out. Happy Cookin! Great to see you! Thanks for the comments. Yum! Will definitely try this recipe!